It’s a trite but true statement: time flies when you’re having fun. I can hardly believe 12 years have passed since I started using my September columns to celebrate banned books. Way back in 1982, the American Library Association set aside the last week in September to highlight the importance of making books with unusual or unpopular viewpoints available to those who want to read them. 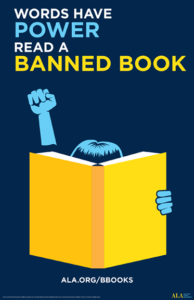 Banned Books Week has been going strong ever since, because there’s never a shortage of people who want to dictate what other people and their children ought not to read. And no shortage, thankfully, of those who staunchly defend the right to read freely. To prepare for this column, I pulled out half a dozen beat-up three-ring binders in which I’ve stored every newspaper column I’ve ever written. Hundreds and hundreds of them. Resisting the temptation to read and reminisce, I flipped to October 1, 2006, the first year I wrote about banned books. The subject of that column? “Captain Underpants” by Dav Pilkey. Since then, I’ve written about numerous other banned books. Some years, I used every September column to write about a controversial book. Other times, I wrote about just one. Certain titles tend to appear on the ALA list year after year. Others come and go. Some books are challenged because they contain profanity, violence or unorthodox religious or political viewpoints. Not surprisingly, the biggest reason books are challenged as inappropriate for school or public library shelves is sexual content, particularly if that content relates to homosexuality or transgenderism. For what it’s worth, here’s the list of all the banned books I’ve reviewed. Space restraints prohibit me from listing the authors’ names, but google can help with that. I’d love to know which of these books you’ve read and what you think about them or about any other banned book. You may contact me at jennieivey@gmail.com or send snail mail to the Herald-Citizen. I just might use your answers in a future column. Happy reading!